Posted by liverpoolchamber in Charity, Events. MYP’s Annual Charity Ball will be held on 3 October 2008 at the exclusive BT Convention Centre. 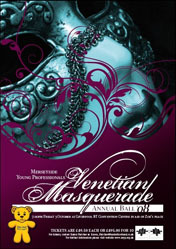 This year the Ball will have a Venitian Masquerade theme with masks being available for purchase on the night. The evening is always good fun and raises much needed funds for our nominated charity which this year is Zoe’s Place. It promises to be a cracker of evening and we hope that as many of our members, their colleagues and friends will be able to attend as possible. Tickets are now selling quickly so if you wish to guarantee your place please contact any of the Ball Committee or Karen Fletcher to confirm your booking requirements. To view further details visit the MYP website.